If you’re looking to give your office a healthy and stylish facelift, then you might wish to consider installing aluminium framed, glass partitions. If you seek out a reputable and reliable company such as Alpha Ceilings and Partitions, they will be able to help you actualise this new look. Having glass walled partitions promotes an open plan office, whilst providing an element of privacy. The fact is, glass can look gorgeous and elegant, which reflects a sleek and professional look in a modern office; particularly for those which receive regular visits from clients. It’s a great way to show that management don’t have anything to hide and are happy to work away in plain view of the rest of the office. Of course, you can opt for frosted or tinted windows for meeting rooms if you would like the additional privacy; but at the very least you can take advantage of the noise reduction. The reason why glass partitions can help you cut down on your energy bills is because you won’t have to worry about having so much artificial lighting installed. For example, a regular walled off office is going to need its own Lightsource, whereas a glass partition will not. In addition to that, a glass partition is cheaper and easier to assemble than a standard wall. That, and they are equally as easy to dismantle and move around which offers you a unique opportunity to change things up as and when you need to. The fact is, when working behind a wall where no one can see you, people slack off. We’re not pointing any fingers, because we’ve all been guilty of it from time to time. Having glass partitions installed on the other hand, significantly reduces the odds of employees being able to get away with doing nothing. When people know that they can be seen by other people, they will feel the drive to crack on and do their work to save getting into any trouble or being questioned. In addition to that, employees will feel more comfortable cracking on with phone calls if they have ‘audible’ privacy, in that they can be seen, but not heard. Besides the practical benefits, the aesthetics should be reason enough. 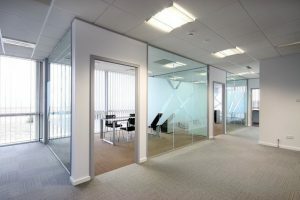 Glass partitions look great and can drastically improve the look of an office space. If you’re interested in exploring it further, then search online where you will find a wealth of companies like Alpha Ceilings and Partitions. Do you research and find the most appropriate company for you and then get to planning your office facelift!